Hookeychain: Where Are My Keys? Yes I know, we’ve all been there, searching feverishly for those darn keys. And i don’t know if you’ve noticed but it always happens when you’re in a rush, in the morning or trying to catch the last train at the end of the day. Seeing a person who lost their keys is not a pretty sight; frantically flipping notes, ransacking a bag, or even crawling on the floor. The Hookeychain is more than just a hook, it’s a keychain with a built in hook. 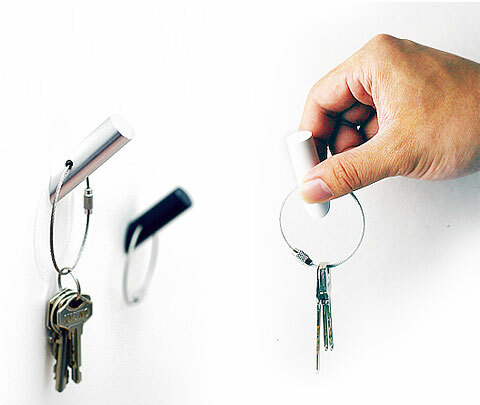 An Aluminum stick with a super magnet base, this key holder is simple yet stylishly designed. It will fit any space perfectly – attach it to the side of your metal desk or cabinet or simply stick it against your fridge with a note or card – all you need is a magnetic surface. But don’t hang your cloths there, it’s for keys only. Available in 3 colors, Gold, Silver, and Black.